Disasters threaten all parts of the world and they appear to be increasing in frequency, scale and intensity. Despite huge improvements in the emergency response, permanent reconstruction is often uncoordinated, inefficiently managed and slow to begin. International agencies are geared to an efficient response in terms of humanitarian relief, but they are not well versed in the requirements of long-term reconstruction, which is often constrained by lack of planning and poorly coordinated management. The construction industry is typically engaged in a range of critical activities after a disaster, including provision of temporary shelter in the immediate aftermath and restoration of permanent shelter and public infrastructure once the immediate humanitarian needs have been attended to. Post-Disaster Reconstruction of the Built Environment identifies the challenges that face the industry and highlights best practice to enable the construction industry to address those problems which make an effective response to these unexpected events difficult. 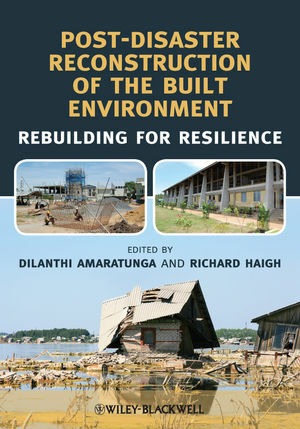 Written by an international team of experts, this book will help researchers and advanced students of construction understand the problems faced by communities and the construction industry when faced with a natural or man-made disaster, and identify the planning and management processes required by the industry to mount an effective response. Dilanthi Amaratunga is the Professor of Disaster Management at the University of Salford, UK where she leads the University's Centre for Disaster Resilience. Richard Haigh is a Senior Lecturer at the Centre for Disaster Resilience, the School of the Built Environment, University of Salford, UK. 1 Introduction (Richard Haigh and Dilanthi Amaratunga). 1.2 Why focus upon the built environment? 1.3 Resilience in the built environment. 1.4 Disasters as a window of opportunity. 2 Capacity Development for Post-Disaster Reconstruction of the Built Environment (Kanchana Ginige and Dilanthi Amaratunga). 2.2 Capacity needs for post-disaster reconstruction. 2.3 Capacity gaps in post-disaster reconstruction. 3 Capacity of the Construction Industry for Post-Disaster Reconstruction: Post-Tsunami Sri Lanka (Krisanthi Seneviratne). 3.4 Role of the construction sector in post-disaster recovery. 3.5 Post-tsunami Sri Lanka: the role of the Sri Lankan construction industry. 3.6 Capacity of the construction industry in post-tsunami reconstruction. 4 Resourcing for Post-Disaster Reconstruction: A Longitudinal Case Study Following the 2008 Earthquake in China (Yan Chang, SuzanneWilkinson, Regan Potangaroa and Erica Seville). 4.2 The impact of the 2008Wenchuan earthquake. 4.3 Wenchuan earthquake reconstruction process. 4.4 Resourcing forWenchuan earthquake reconstruction. 4.5 Key resourcing problems and solutions adopted by the Chinese reconstruction teams. 5 Empowerment in Disaster Response and Reconstruction: Role ofWomen (Nirooja Thurairajah). 5.2 The concept of empowerment. 5.4 Women in a post-disaster setting. 5.5 Women's empowerment in post-disaster reconstruction. 6 Community-Based Post-Disaster Housing Reconstruction: Examples from Indonesia (Taufika Ophiyandri). 6.4 Community participation in reconstruction. 7 Stakeholder Consultation in the Reconstruction Process (Nuwani Siriwardena and Richard Haigh). 7.3 Stakeholders and post-disaster reconstruction. 7.5 Expectation gaps in post-disaster housing reconstruction. 7.6 Developing a stakeholder engagement strategy. 8 ProjectManagement of Disaster Reconstruction (Udayangani Kulatunga). 8.2 Procurement and contract management. 8.3 Sourcing of labour, material and equipment. 9 Legislation for Effective Post-Disaster Reconstruction: Cases fromNew Zealand (James Olabode Rotimi, SuzanneWilkinson and Dean Myburgh). 9.3 Legislative and regulatory considerations post disaster. 9.4 Improving recovery through legislation. 9.5 Impediments to post-disaster reconstruction: the New Zealand Building Act (BA) 2004. 9.6 New Zealand Case Study 1: Manawatu-Wanganui Floods, 2004. 9.7 New Zealand Case Study 2: Matata (Bay of Plenty) Floods, 2005. 9.8 Lessons for post-disaster legislation changes. 10 Conflict, Post Conflict and Post-Conflict Reconstruction: Exploring the Associated Challenges (Krisanthi Seneviratne and Dilanthi Amaratunga). 11 Private Construction Sector Engagement in Post-Disaster Reconstruction (Richard Sutton and Richard Haigh). 11.2 Challenges in post-disaster reconstruction. 11.3 What is the role of the private sector? 11.4 Business and humanitarian collaborations. 11.6 Encouraging private sector participation. 11.7 Integrating private construction sector support for post-disaster reconstruction. 12 KnowledgeManagement Practices and Systems Integration (Chaminda Pathirage). 12.3 Knowledge management in disaster management context. 12.4 Sharing and transferring disaster management knowledge. 12.5 Case studies of good practices and lessons learned. 12.6 Capacity enhancing and knowledge strategies: the ISLAND project. 13 Restoration ofMajor Infrastructure and Rehabilitation of Communities (Kaushal Keraminiyage). 13.2 Impact of disasters on infrastructure. 13.3 Impact of the failure of infrastructure in disaster-affected communities and infrastructure interdependencies. 13.4 Post-disaster infrastructure reconstruction and restoring major infrastructure. 13.5 Post-disaster infrastructure reconstruction for improved quality of life. 14 Sustainable Post-DisasterWasteManagement: Construction and Demolition Debris (Gayani Karunasena). 14.2 Construction and demolition debris management in post-disaster situations. 14.4 C&D debris management and sustainability. 15 Linking Reconstruction to Sustainable Socio-Economic Development (Roshani Palliyaguru and Dilanthi Amaratunga). 15.2 Post-disaster reconstruction as a window of opportunity for development. 15.3 Millennium development goals as a framework of action for sustainable socio-economic development and infrastructure reconstruction. 15.4 Post-disaster infrastructure reconstruction as a sustainable socio-economic development strategy. 16 Disaster Risk Reduction and its Relationship with Sustainable Development (Kanchana Ginige). 16.2 Disasters: a result of poor development. 16.3 Disasters: a barrier for development. 16.4 Disaster risk reduction for sustainable development and vice versa. 17 Conclusion (Richard Haigh and Dilanthi Amaratunga).